So I left you all just before we crossed the equator, the fleet had started to compress as cloud activity increased but team Scallywag were trailing after being the first to struggle to escape an almighty thunderstorm. 36 hours later the tables turned and with huge cloud activity, teams were battling to find their way through the doldrums. Satellite imagery showed thunder cells of up to 45-70nm in size that were self-perpetuating and impossible to outrun once you were in their line. Scallywag benefited from the initial rear positioning of these thunder cells, enabling them to see the lead boats struggling to get through the active cloud band, and adding confidence to the decision to hold further west for clearer line in the cloud activity. This allowed Scallywag to close quickly on the fleet but our westerly position is always considered more high risk as ultimately you are trying to get to the NE trades, and the quickest way to reach them would be to head north. The general patterns are usually captured quite well in the weather models but actually picking out the clouds and associated wind patterns, with very few real observations or historical data will always mean the detail is poor. The fact is the model provides a good overview, but in reality it’s crucial to observe the local conditions to make an informed decision as best you can. The reality was as Scallywag tried to get to the NE trades we actually had a westerly where the model expected an easterly. The exact opposite….work with that. Real time data was ultimately key here using the RADAR to identify showers and weave around them, satellite information to look at the bigger picture and positioning and then the ASCAT winds (surface winds derived from a satellite which uses backscatter from the sea state to decipher the surface wind) to further confirm what is or isn’t predicted to be out there. Ultimately, of the lead boats the most north and east came out the strongest, but at the same time the NE trades filled in ahead, and to the west of the clouds is where the majority of the fleet got caught. So as they were able to escape the cloud, team Scallywag continued to progress in less cloud affected conditions and come out at a faster angle with effectively less miles to go. In theory, once in the trades, it would be a drag race to the Philippines and initially, team Scallywag extended on the rest of the fleet reaching the stronger winds first. But then as the wind got lighter and Scallywag got lifted, they went from being the most Leeward-forward boat to being the Windward-forward boat, giving significant leverage to the fleet. 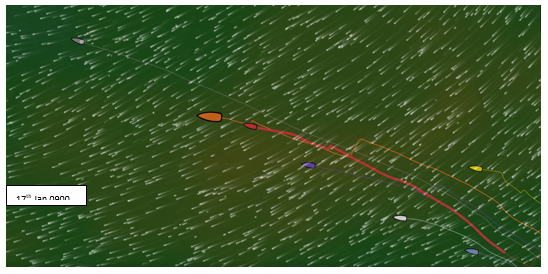 Vestas, Dongfeng and Akzonobel had taken the opportunity to do a short hitch further south and pick up better pressure and a better angle, for Scallywag, who was further ahead and still heading towards the finish, gybing would have meant heading away from the finish. In hindsight, if Scallywag had gybed about 12-16 hours before they did, this would have been a better option; it would have been a direct loss immediately but the gybe would have been shorter and got Scallywag into the pressure sooner and most likely maintained a larger lead. But we will never know. In the final 2 days teams began to use their stealth mode to allow them to reposition on their competitors or hide any big decisions, in particular in the approach to the Luzon Straits, the stretch between Taiwan in the north and the Philippines in the south. Here, the routings varied for what individual teams should do and often switched from run to run, ultimately there was 15-30mins difference in taking the route to the north towards Taiwan versus gybing along the Philippine coast. Ultimately all teams chose the Philippine coast. 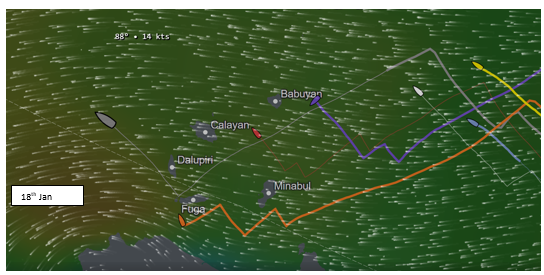 Team Vestas tried to maximise use of the strong current going current west along the top of the Philippines and ultimately get west to the strongest and more headed pressure for the approach to Hong Kong. 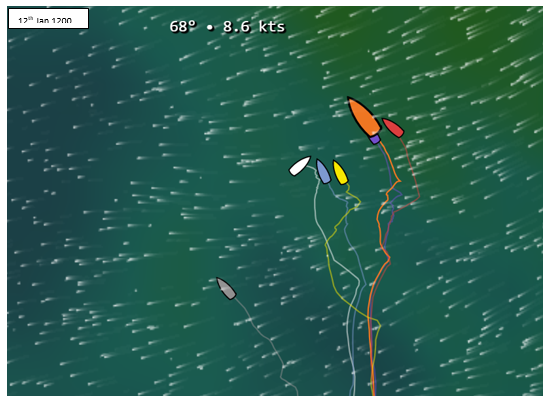 This final line up is not without passing opportunities and looking at the tracker you can see that Dongfeng made the biggest gains here, by gybing earlier than Scallywag and Vestas they set themselves up to be at a faster angle for the second half where the wind heads and accelerates between Taiwan and China. It is likely here that the while Scallywag and Vestas were on their J1s reaching for a while, Dongfeng was always on their MH0 or J0 – bigger faster sails. However, the result was already decided from that final gybe from the Philippines and little changed. The teams have set off to Guangzhou in China, a leg where any team that does the leg gets a point, this is because it isn’t actually a race; the boats will simply transit there to do an In-Port Race and commercial activity. On the way up we are largely overnight but heading back I will be sure to take some pictures and share the journey on my return, along with the Leg 6 preview.